Installing Podcast Generator on Rackspace Cloud Sites is actually quite easy. Creating a sub directory or subdomain installation for Podcast keeps it clean. In our previous article, we have described about the technical part of Podcast and Podcasting. Installing Podcast Generator on Rackspace Cloud Sites will enable you to generate Podcast separately – in other words, if you are not using a CMS or Blogging software like WordPress or want to keep Podcast separate, this Podcast Generator will help to aggregate and manage them easily. It is a 3 MB sized download. The next thing you will need is FileZilla or any SFTP software. 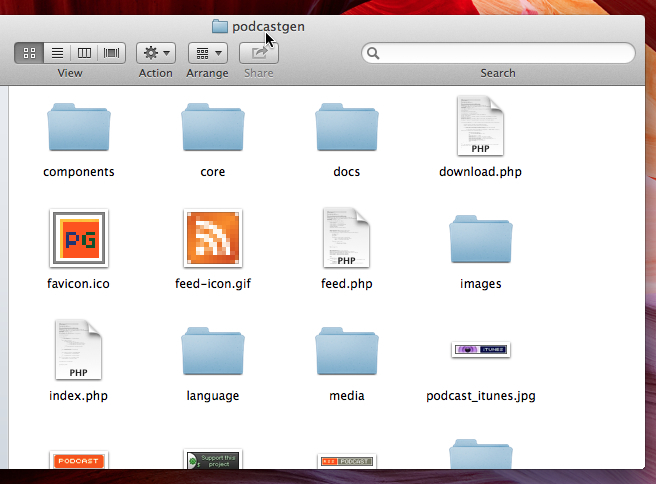 Possibly you will want a subdirectory for the purpose for installing Podcast Generator. In that case, open FileZilla, go to Content folder and create a folder with an intended name (like podcast) and drag and drop all the files and folders of the screen shot above to this newly created folder. Right click and recursively CHMOD to 777 the – “media” folder, “images” folder and the script root folder. By the way, you will definitely want to change few image files for branding – one is favicon.ico file in root and another is itunes_images.jpg under images folder. You can change the image inside the themes folder too. Point your web browser to the folder to start the setup wizard. There is no need to create a MySQL database for Installing Podcast Generator on Rackspace Cloud Sites. Simply follow the wizard to complete the installation. You can use the Cloud Files PHP script and redirect the contents of media files to the assigned Cloud Files container to reduce load on the server. You can name the sub directories in a SEO friendly way too. This Article Has Been Shared 2910 Times! Wordpress Caching and Speed Optimization for Advanced Cloud Setup is hard as most Cloud providers keeps combination hidden. Here is master guide of the rules. Cite this article as: Abhishek Ghosh, "Installing Podcast Generator on Rackspace Cloud Sites," in The Customize Windows, February 1, 2013, April 21, 2019, https://thecustomizewindows.com/2013/02/installing-podcast-generator-on-rackspace-cloud-sites/.